If you want or need to work, no matter your age, you should be able to. It’s up to you. Organizations also have a responsibility to do something about ageism, which is blamed as the culprit for older workers not finding jobs -- I’ll cover what organizations need to do later. It’s my point of view, though, that it’s up to you to go after the job you want and get it! It’s about having an attitude that you are damn good, a passion for your field or the field you want to break into, constantly learning, and applying new skills. Getting and keeping a job, whether you are 40, 70, or even 25, is about manifesting those four aspects. I’m 73 and still working because I want to. I’ve not had trouble getting or keeping a job – oh maybe a few times when I was younger before I developed and manifested attitude, passion, and perseverance. If you are blaming your age, the company, the industry, or the younger recruiter that isn’t hiring you, you may be a bit of the problem. OK. I admit it’s not always easy to be the oldest worker in an organization peopled by workers a third my age. I have to combat my own fears of mental and physical decline more than I like, especially after breaking my ankle a few months ago. I feel I have to spend extra time learning new skills – maybe a new area in my field or a new program. I have to force myself to set goals and meet them. Now let me cover the reality that ageism does exist, particularly in the Tech industry based on research. At Visier, a people analytics product company, delivered as a cloud solution, we have the opportunity to analyze people data from most of our 100+ customers who represent multiple industries. Over the past few years we’ve seen numerous articles about ageism in the Tech industry, and so mined this data and uncovered some truths and also some myths about ageism. Not only is there anecdotal evidence of ageism but also data-based evidence of systemic ageism. But still – don’t let that get you down. Go for the job you want, because you are great! Many Tech professionals over age 50 (and even a number over age 40) believe ageism exists because of their own personal difficulties finding work later in their careers. Certainly, there have been numerous class-action lawsuits about ageism against Silicon Valley giants, even more than about racial or gender bias. Situational ageism–prejudice or discrimination on the basis of a person’s age–is an important issue organizations across industries should be aware of and take steps to monitor and improve. Not just because of fairness or to reduce the risk of age discrimination litigation, but also because of upcoming retirements and the resulting skills shortages. In the past 50 years, the size of the US workforce has grown an average of 1.7% annually. In the next 50 years, the US workforce size will grow by only 0.3% annually. Does Ageism Exist in Tech? In short, yes. 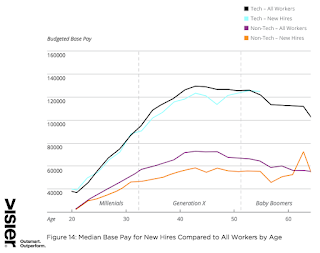 A Visier Insights Report on ageism in the Tech industry  found that Tech does hire a higher proportion of younger workers and a smaller proportion of older workers than in other industries. Is this disparity in hiring due to systemic ageism in Tech? To investigate this, we first strove to determine if the disparity is related to the availability of talent versus an intentional bias towards hiring younger workers. We found that hiring decisions in Tech do indeed favor younger candidates, hiring Millennials over Gen X candidates at a higher rate than in non-Tech industries. This answer has traditionally been difficult to get: While leading Tech companies publicize their organizational ethnic and gender composition data, little data has been shared about the age makeup of the Tech workforce5. We began our research into ageism by looking at the breakdown of the workforce by age, comparing the Tech industry to non-Tech industries. Using the Visier Insights database—an aggregation of anonymized and standardized workforce databases that for this report included 330,000 employees from 43 large US enterprises (those with at least two years of verified and validated high-quality data)—we were able to examine the role of age in the workforce like never before. Our research showed that the average Tech worker is 38 years old, compared to 43 years old for non-Tech workers. The average manager in the Tech industry is 42 years old, compared to 47 for non-Tech industries. 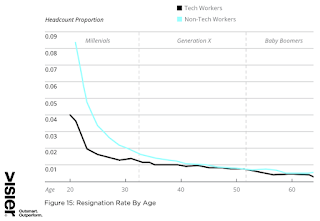 It comes as no surprise that Tech workers are younger on average, but our research clarified some key misconceptions related to the salary lifecycle, resignation rates, and perceived value of older workers. While the average Tech worker is five years younger than the average worker, it is a misconception that older workers are less valued in Tech. From age 40 onwards, non-manager workers in Tech enter the “Tech Sage Age” and are increasingly likely to receive a top performer rating as they age, mature, and gain experience. 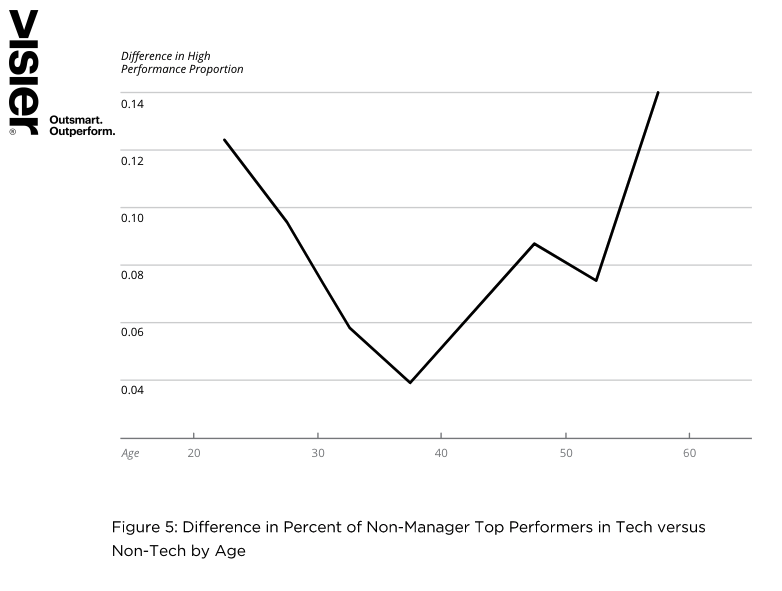 Conversely, the proportion of top performers decreases with age in non-Tech industries. This finding suggests that maturity and experience are more important drivers of high performance in Tech than in Non-Tech industries. Older Tech workers as a group do not experience a reduction in average salary that is any different from non-Tech industries. Rather, workers in Tech experience the same salary lifecycle as their counterparts in non-Tech. 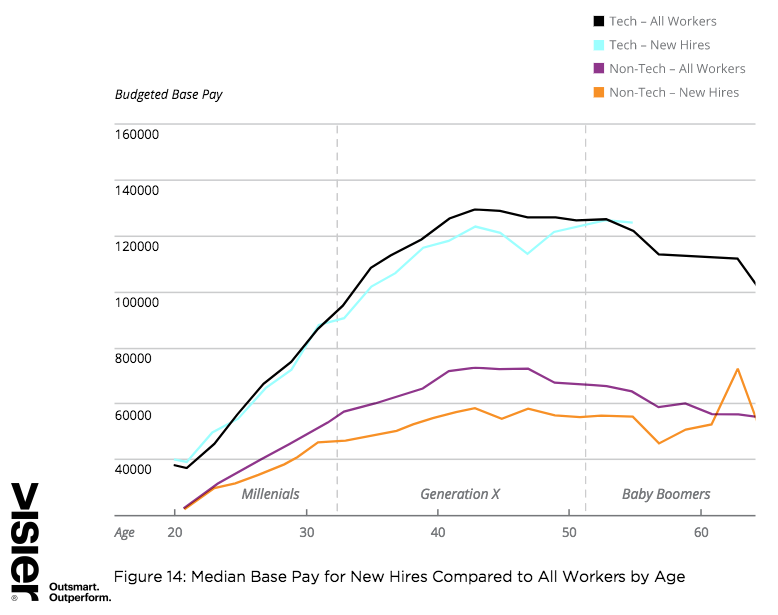 Older Tech workers that are newly hired do not — on average — experience a lower wage. Rather, newly hired workers are paid the same average salary as more tenured workers, across all age groups. 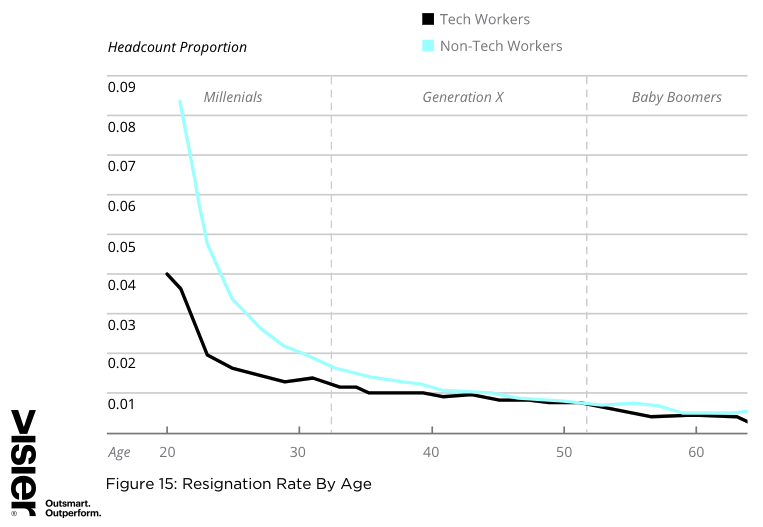 The average resignation rates by age for Tech and non-Tech workforces show that older Tech workers — from age 40 onwards — have the same first-year resignation rate as their non-Tech age counterparts: approximately 10%. This concludes Part I of Ageism: Is it True or is it You? Stay tuned for Part II, which will take a closer look at what organizations can do to combat ageism. Lexy Martin is a respected thought leader and researcher on HR technology adoption and their value to organizations and workers alike. Known as the originator of the Sierra-Cedar HR Systems Survey, she now works at Visier continuing her research efforts, now on people analytics, and working closely with customers to support them in their HR transformation to become data-driven organizations. Lexy is Principal, Research and Customer Value at Visier. Connect with Lexy at lexy.martin@visier.com or personally at lexymartin1@gmail.com. The Tech companies included in our research represent the diverse fields within the Tech industry from Software Development, Hosting, Data Processing, Telecommunications, Computer Systems Design and Scientific Services. 5 Hacking the Diversity Problem with Big Data Analytics, John Schwartz, Data Informed, February, 2015.